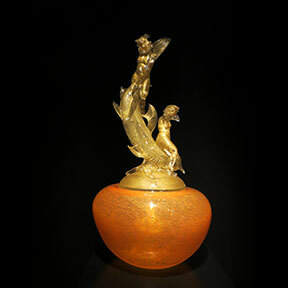 The Venetian maestro first worked with Chihuly in 1989 and their collaboration resulted in the Putti series that combined vessel forms with hot-glass figurative sculpture. 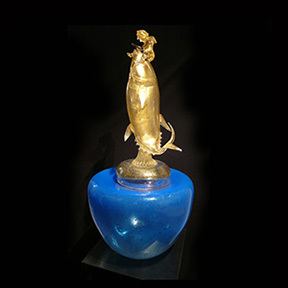 In their marine series from 1996, mischievous putti cavort with fish, dolphins and other underwater life. 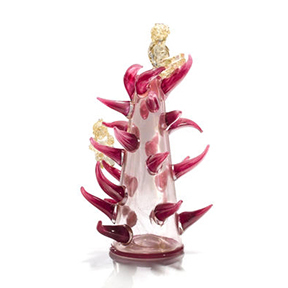 Signoretto was acclaimed as the world’s leading glass sculptor with absolute mastery of his material and he was a very popular instructor with many artists learning from his glass blowing performances.